This is the third in a series of posts on NGDP targets. Links to the earlier two are given at the appropriate points in the text. At last we are getting a Bank of England led debate on alternatives to UK inflation targeting. Charlie Bean gave a speech on Wednesday on nominal GDP (NGDP) targeting which is well worth reading, not just because he is Deputy Governor for Monetary Policy at the Bank (and of course on the MPC), or because he is one of the UK’s top macroeconomists (he was at the LSE before going to the Bank), but also because he is something of a veteran on this issue, having written a chapter of his PhD on the topic. Charlie quite rightly distinguishes between NGDP growth and NGDP levels targets. On the former, he argues that their superiority over inflation targets in the face of cost-push shocks (shocks to inflation, like increases in VAT)  is something of a red herring, because in practice inflation targets are flexible, and central banks have the discretion not to come down too hard on such shocks. That is the party line, which I called into question here. What is interesting is that he goes on to say that one advantage of NGDP growth targets is that “it might lead to fewer instances where we have to resort to the use of our ‘constrained discretion’ to justify a temporary acceptance of inflation away from the target”. I think that may be a subtle way of saying that the MPC has felt inhibited from exercising this discretion in the recent past, and as a result it has not pushed stimulus measures as hard as it might over the last few years, and indeed on one occasion came close to raising interest rates. I’m also glad to see that the MPC are now forecasting inflation above 2% in two years time, yet they are also moving towards more QE, which suggests their appetite for discretion has returned. Perhaps what Charlie is saying here is that he did not vote in favour of more QE last month because he still felt constrained by the inflation target. On NGDP levels targets, Charlie shows some simulations of a toy New Keynesian model which illustrate the advantages of NGDP level targets when interest rates hit the zero lower bound (ZLB). The model assumes that there are no alternative monetary policy instruments. Similar pictures can be found in Eggertsson and Woodford. Here I cannot help repeating a point I have made before. While NGDP targets get close to the optimal monetary policy, they still mean any demand shock has a significant negative impact on output and inflation while interest rates are at the ZLB. Expansionary fiscal policy still has an important role to play, and austerity will make things much worse. I want to make one final point, which I do not think is mentioned often enough. Levels targets (for prices, or NGDP) are not just advantageous when we hit the ZLB. In the lectures I have just finished to second year undergraduates, I go through a little numerical example of how monetary policy might deal with a one-off cost-push shock (perhaps an increase in VAT), assuming for simplicity that monetary policy has perfect control over the output gap. Crucially inflation is forward looking (the Phillips curve is New Keynesian), and current inflation depends on inflation expected next period. If policy can only act in the same period as the cost-push shock (the ‘first period’), it reduces the output gap to get the best trade-off between higher inflation and lower output. However, I show the students that if monetary policymakers can also change output in the next period (the second period), they will lower output in that period as well. This will generate negative inflation in that second period, but bad though this is in itself, the anticipation of it reduces inflation further when the cost-push shock hits in the first period. If policy does it right, and expectations anticipate policy and its impact, by reducing output in both periods it can improve welfare compared to the case when it only acts in the first period. Now I present this as an example of the problem of time inconsistency. By promising to reduce output in the second period, we get a better outcome. But once we get to that second period, the policymaker or the public may ask why do we need to actually go through with the plan? It was beneficial to promise to reduce future output and inflation when the shock hit, but now the shock is over it would be better still to do nothing. If the policymaker changes their policy as a result, then of course a rational public will anticipate this, and we will not get the benefits in the first period, because these benefits come through expectations effects. So to overcome this time inconsistency problem, we need some device to commit the policymaker to stick to the plan. So the case for levels targets (often called history dependent targets) is stronger than the particular issue of hitting the ZLB. However it depends crucially on the idea that agents are forward looking. Replace this New Keynesian Phillips curve with something more old fashioned and ‘backward looking’ in this particular example, and price level targets would just involve additional costs with no benefits. Other models would give different results (see, for example, a well known paper by Svensson .) However I think it is reasonable to make the following generalisation: this particular attraction of levels targets (of which NGDP levels targets are an example) depends crucially on how forward looking we think agents really are. Bean, C.R. (1983). ‘Targeting nominal income: an appraisal.’ Economic Journal, vol. 93, (December), pp. 806-19. In the face of such shocks, the central bank can only reduce their impact on inflation by reducing output. A strict inflation target means you ignore the output costs of reducing inflation, whereas a nominal income target will mean you have a chance at getting nearer the optimal trade-off between lower output and inflation. Svensson, Lars E.O. (1999) “Price-Level Targeting versus Inflation Targeting: A Free Lunch?” Journal of Money, Credit, and Banking, vol. 31, no. 3, pp. 277-95. For more details on the ratings agencies, see Jonathan Portes here. For the Chancellor, from now on things may start to get better, if only because they have become so bad. The UK may just avoid a triple dip recession, and may even grow at more than the snails pace predicted by forecasters. Any growth will be talked up as if it is a new dawn, and people will want to forget the last few years as quickly as they can. This may even be enough to see a Conservative government elected in 2015. In that case, George Osborne as politician will be vindicated. But this blog is about economics (mainly). As far as macroeconomics is concerned, nothing that will come can repair the damage that has been done over the last two and a half years. Hence the finality of my title. It would be foolish to argue that all of the UK’s economic woes are down to its Chancellor. The financial crisis has generated some particular problems for the UK, which most Chancellors of the Exchequer would have struggled with. What George Osborne did with his austerity programme was the equivalent of putting a sick patient on a starvation diet accompanied by cold showers. The UK economy without accelerated austerity would still have been in poor shape, but under George Osborne it has been a disaster. It is perhaps telling that the best we can say for the record of the last two and a half years is that maybe the statisticians have got the numbers wrong. Maybe more of nominal GDP growth is real and less is inflation. Without such a major rewrite of the data, the record is dismal. Effectively no growth, during a period in which we would normally expect a significant recovery, a recovery that had already begun before he took over. Those who say that the employment numbers are not so bad completely miss the point (journalists please note): if the numbers are right it seems that productivity and the supply side of the UK economy have also stalled in the last few years, implying that the loss of output could even be permanent. A temporary loss of output (and the increase in unemployment or lower real wages that goes with it) is bad enough, but to permanently reduce output forever is some achievement. For once, the word disaster is not an exaggeration. What about that terrible legacy the previous government had given him, which he never fails to mention? Absolute nonsense. The record of the previous government was far from perfect, but they did not create a horrible mess that he had to put right. What about the debt crisis? The panic of 2010 might have justified promises of future austerity, perhaps with immediate action which demonstrated intent in ways that did least harm to aggregate demand. When I was asked by one of his advisors what this might involve, I suggested temporarily raising estate taxes (death duties) - what better way to show you are deadly serious about reducing the deficit than doing something that had big political costs for you, yet with a relatively small impact on demand. Yet for a Chancellor where politics is key, what we got instead was front loaded austerity, which even Nick Clegg has recently acknowledged was in areas that did maximum damage to the economy. After the panic of 2010 was over, when it became clear that the debt crisis was really a Eurozone crisis and UK long term interest rates declined with the fortunes of the economy, we should have had a major change of policy. There were many possibilities besides conventional stimulus, such as balanced budget fiscal expansion, or changes to the monetary policy regime. But these would all have involved political costs, so instead we had short term tinkering coupled with the prospect of more austerity beyond the next election. Can he blame the advice of others? Sure there was bad advice from some influential quarters, but there were also plenty (a majority, indeed) of reputable economists who correctly warned of the dangers the policy involved. So austerity was always a gamble - a gamble that the UK economy was strong enough to be able to offset the undoubted negative impact of accelerated austerity. It was not. So what was the prize that led to this gamble? Again it had little to do with macroeconomic policy. As Paul Krugman has pointed out many times, the ‘debt problem’ is seen by many on the right as a useful cover to reduce the size of the state. Seen through this lens, the details of the austerity programme make much more sense. A focus on demand ‘rich’ items like investment, local authority spending and welfare, and avoiding temporary increases in taxes that have a much lighter demand impact? - because the aim is to permanently reduce the size of the state. George Osborne was prepared to take a gamble with the economy for political ends. Of course all Chancellors are politicians. Most would take small liberties with the macoeconomics to gain political advantage: for example before 1997 by delaying raising interest rates until after the party conference, or after 1997 by being a little too optimistic about tax receipts to minimise unpopular tax increases. However in most cases these are the equivalent of minor indiscretions, which do not fundamentally alter the fortunes of the economy. The centrepiece of Osborne’s strategy was accelerated austerity for political ends, and it stopped the recovery dead. So my final verdict on George Osborne? He is a political tactician, who time and again has put party political gain ahead of the economic interests of the economy. We see this in many ‘small’ things, like the contents of his last budget and Autumn statement, to more important things, like his support for policy on immigration or Europe. It is defined by both what he has not done (total inaction on monetary policy, when - unlike the US and Europe - he has considerable power), as well as what he has done (accelerated austerity). The politics may still come good for him, but the damage to the UK economy his action and inaction has caused is final. I like teaching Ricardian Equivalence. Ricardian Equivalence is the idea that consumers will respond to a tax cut by saving the full amount, and not spending any of it. (Here we are concerned only with the impact of the tax cut on income, and we ignore any incentive effects.) It is counterintuitive, so it makes students think. It illustrates the importance of intertemporal budget constraints: that a tax cut financed by borrowing, and holding future spending fixed, must imply higher future taxes to either pay back the borrowing or pay the interest on that borrowing. So a consumer that thinks ahead (and that faces the same interest rate as the government) will have to decide not just how they respond to the tax cut, but how they will pay for future tax increases. Finally it gets across the idea of consumption smoothing in the absence of credit constraints: if a consumer wanted to spend more today and spend less when taxes go up, they will have already done so by borrowing themselves. Now macroeconomic textbooks will tell you many reasons why Ricardian Equivalence does not hold. Some of these are also interesting for students to explore. However one basic point often does not get the emphasis it deserves, and that is the assumption that the future path of government spending on goods and services remains unchanged. Only by making this assumption can we say that a tax cut today will mean tax increases tomorrow. In reality consumers who receive tax cuts have very little information about what the implications will be for future taxes or spending. (Things are probably getting better, but as the IMF paper discussed in this post from Carlo Cottarelli makes clear, there is a long way to go.) Even if the current government did say that the tax cut was temporary, and would require higher future taxes to pay back the borrowing, and the consumer believed that government, it is quite possible that a different government might be in power when the time for higher taxes came. If that different government chose to cut its spending rather than raise taxes, then the consumer would be better off in terms of their income as a result of the tax cut. A tax cut today paid for by lower government spending tomorrow will lead to higher consumption today. The practical importance of this point for temporary tax cuts is probably not great. One of the points I try to get across when teaching is to distinguish between the implications of internalising the government’s budget constraint (which is ‘economics’ for thinking about how the government will eventually pay for a tax cut) and the implications of consumption smoothing. In the standard consumption model, a temporary tax cut, even if it is eventually paid for cutting government spending, will still lead to a quite small immediate increase in consumption, because the consumer will want to spread the benefits over time. If you want to argue that temporary tax cuts will lead to significant changes to consumption, you need to focus on alternative models of consumer behaviour. The lack of information provided by governments about future fiscal plans, and their inability to commit to such plans in a democracy, is also relevant in trying to distinguish between temporary and permanent tax cuts. Governments often like to pretend tax cuts are permanent even when they cannot be. Those in the US do not need reminding that occasionally governments pretend tax cuts are temporary when they want them to be permanent. Tax cuts could be permanent if they are paid for at some later date by a permanent reduction in government spending. As a result, a tax cut could be a signal that government spending will at some stage be permanently reduced. If that signal is correct, it makes sense to consume all of the tax cut. So Ricardian Equivalence is a great thought experiment, but never a realistic possibility in a world where governments cannot commit on fiscal plans. Perhaps useful for the macroeconomist as scientist, but never the final answer for the macroeconomist as engineer. The macroeconomist as engineer needs to think about the possibility that a tax cut today implies a change in future plans for government spending, and that consumers might act on that possibility. We also assume no default or printing money. Whether the consumer’s overall welfare is higher is another matter, but that is beside the point here. Under certain conditions, a Barro type consumer who cares about their children will just consume the interest their receive on the amount of the tax cut. In particular, both the existence of credit constraints and precautionary saving really matter here. A further possibility is that the tax cut represents favourable news about future growth, which also implies that the consumer is permanently better off. The reviews of the first episode of Mark Carney and the Treasury Select Committee seem generally favourable. Of course those wanting to see inflation targeting killed off right from the start were disappointed (as they were bound to be - you cannot kill an established star that quickly), but its demise has not been ruled out. From my point of view one of the real positives from the show was the evident desire of the new Governor to have a debate about the monetary policy framework, a debate which as I noted before has been largely missing in the UK. Martin Wolf, as ever, eloquently explains (£) the reasons why we need this debate, and I’m glad to see his suggestion that we might look at earnings growth as well as CPI inflation. To put the point strongly, one reason why monetary policy is currently so passive around the world is an unjustified obsession with just one particular measure of inflation. Martin Wolf also says we need to talk about helicopter money, and the FT leader took a similar line the previous day. Here I admit I am conflicted. The macroeconomist in me wants to complain: as I have said in the past, helicopter money is either a plea for fiscal expansion - which is good, but why not call it that - or a policy for above target future inflation, which may also be good but why not call it that too? However perhaps I am being politically naive - maybe it is the only way we can get governments at the moment to undertake fiscal expansion. Let me first summarise the macroeconomics as I see it. Suppose the government cuts taxes using new money created by the central bank (often called base money). This helicopter money seems formally equivalent to debt financed tax cuts, with the central bank buying the government debt through Quantitative Easing (QE), and then destroying the debt so it can never be sold. If so, helicopter money differs from tax cuts plus QE only in so far as the money creation with QE is temporary (the debt owned by the central bank is not destroyed), while with a helicopter drop it is permanent. With temporary money creation (QE) it is possible to claim that future inflation will not be allowed to exceed the target, because the central bank is free to reverse QE as much as it needs to. Standard macro would suggest that a permanent increase in base money will raise the price level eventually, so it may no longer be possible to prevent inflation exceeding its target at some point. Is this standard macro right? I think many get confused by discussion flipping from prices to quantities or vice versa. They may think that the central bank can always raise interest rates to keep inflation in check. But just as in a free market the apple producer cannot flood the market with apples and keep the price of apples high, the central bank cannot flood the economy with money and keep interest rates high. It cannot independently control base money and short term interest rates. That is the macroeconomics as I see it. What about the naive part. First there is a standard point. A central bank could promise to raise inflation in the future, but will it keep that promise? There is a time inconsistency problem here, which I have talked about before. Perhaps we need some device to force the central bank to make good on raising future inflation, and printing money now might be just that device. In that sense, helicopter money may be a more effective means of increasing future inflation than raising the inflation target. However, if that is the argument, it is better to be honest and call for helicopter money as a means of raising future inflation. The FT leader I mentioned appeared to suggest the opposite. Second, perhaps this is all about fiscal policy after all. Governments have convinced themselves that we need austerity because government debt needs to come down, and helicopter money allows them to relax austerity without compromising on debt. Stop trying to convince governments they can be much more relaxed about debt in a recession, and let them use money creation as a way of getting fiscal stimulus. As long as there is not too much helicopter money, the increase in future inflation will probably be manageable and will help the recovery, so why quibble. 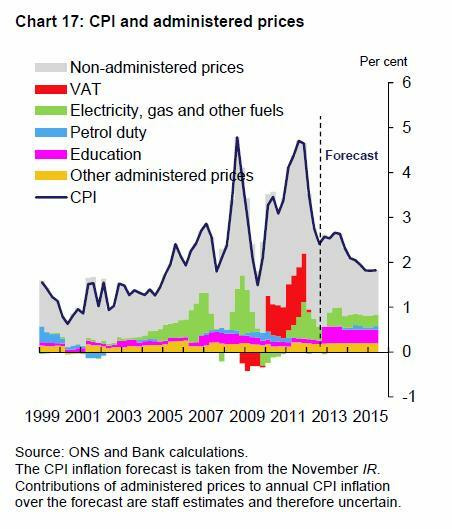 But lets keep quiet about the future inflation bit - we do not want to put them off. Do I think these are the words of a seasoned central banker who is afraid to break a taboo? I suspect instead they are the words of a good macroeconomist who wants to call a spade a spade. If the Chancellor announced bond financed tax cuts, we know Dr. Carney would not object. If he announced a higher inflation target - well that is also a decision for the Chancellor and not the Governor. But announcing a policy that could severely compromise the future Governor’s ability to do what he is mandated to do, while pretending it does not - I think he has every right to object to that. Perhaps the hope is that tax cuts financed by printing money will increase demand - because the government has not issued any debt which will require future tax increases to pay back or service (Ricardian Equivalence will not apply) - yet the central bank can still sell what assets it has to mop up the money created by the tax cut. But as this leaves the private sector holding the same amount of government debt as they would if the tax cut was debt financed, it is difficult to see how this trick could work. As I explained here, if helicopter money was expected to raise prices, consumers would need to save all the tax cut to preserve the real value of their money balances. However savings would still fall because higher prices at the zero lower bound would reduce real interest rates. So the policy is more expansionary because future inflation increases. Here is a closely related post. I cannot help noting, however, that to the extent that austerity involves price increases of some form, you could legitimately argue that the Chancellor is already making life rather difficult for the MPC. Here is a chart from a recent speech by MPC member Ian McCafferty [HT uneconomical]. The FT suggests the government’s increase in university tuition fees may add 0.3% to inflation both this year, and in the following two years. The new Governor of the Bank of England, Mark Carney, will appear before the Treasury Select Committee for the first time tomorrow. The Committee asked for evidence that could help them with their questioning, and I obliged with the short note reproduced below, which also provides a useful summary of my current views on UK monetary policy which have otherwise been scattered around various posts. However the new Governor’s first appearance might also be an appropriate point to say something about central bank communication in the era of the Zero Lower Bound (ZLB). 1) At the ZLB there is really nothing more we can do. We have tried QE, which may have helped at the margins, but decreasing returns have clearly set in, and basically monetary policy is now a spent force. 2) The ZLB means we have to do things differently, but we are still able to achieve the goals set for us using a variety of unconventional policies. The instruments have changed, and everything is more uncertain, but otherwise its business as usual. 3) At the ZLB there are still actions that the monetary authorities can take to try and stimulate demand. However there may be limits to this ability, which means that monetary policy can no longer ensure that the output gap falls to zero and that we hit our inflation target. This needs to be understood when other policy decisions are taken. It is the right thing to say not only because it is nearer the truth, but also because it is the best way to protect central bank independence in the long run. However I realise it requires a whole post to cover all the reasons why this makes no sense, so here is my piece for the select committee, in which no helicopters appear. 1. Monetary policy has two objectives: to stabilise inflation at an acceptable level, and to try to eliminate any output gaps. As a result, academic work on monetary policy has two ultimate goals for monetary policy: to minimise excess inflation and to minimise the output gap. Views about the relative importance of these two objectives vary, and our knowledge here is very partial, but both objectives matter. 2. The current UK monetary policy regime places one of these objectives - targeting inflation - above the output stabilisation objective. This is in contrast to the regime in the United States, which has a ‘dual mandate’, which essentially corresponds to the two objectives outlined above. So why have in the past most macroeconomists, including myself, been relatively content with focusing on inflation as the primary policy objective? 3. The most important reason was that these inflation targets were interpreted in a flexible manner. (The regime is often called flexible inflation targeting.) Specifically the Bank of England has interpreted this flexibility as trying to hit the inflation target in two years time. The general view was that over this kind of time frame, hitting the inflation target would be consistent with closing the output gap. So although minimising the output gap was not a primary policy objective, that objective would be fulfilled under flexible inflation targeting. The theory behind this view is that inflation is ultimately determined by a Phillips curve, which implies inflation will only be stable in the long run if the output gap is zero. 4. Recent UK experience has unfortunately shown that view to be seriously incomplete. Inflation has been persistently above target, yet output is well below its sustainable level. The MPC has currently set policy to achieve the inflation target in two years time, but it does not expect the output gap to come near to being closed in two years time. So the inflation objective is overriding the output gap objective. 5. There are probably two reasons why we now have a conflict between hitting the inflation target and closing the output gap. The first could be called bad luck. The UK economy has been hit by a series of positive inflation shocks: a large depreciation with lagged effects, increasing commodity prices, and increases in certain government charges and taxes. The second is more fundamental and also more a matter of conjecture. When inflation is low, high unemployment appears to have a smaller downward influence than when inflation is higher. One obvious reason for this is that workers are particularly resistant to nominal wage cuts. 6. Whatever the causes, there is now a clear conflict between what a sensible UK monetary policy would be doing and what is actually happening. Monetary policy is not providing enough stimulus to the UK economy, because it is focusing on the inflation target, and not the output gap. Inflation targeting in the UK is not working, and something needs to change. 7. Some commentators suggest that a change in personalities may be sufficient to deal with this problem. I think this is quite wrong. It is clear to me that the MPC takes the Bank’s interpretation of inflation targeting very seriously. It was put very well by Adam Posen in his recent (22nd Jan 2013) evidence to this Committee: “anyone who was on the [MPC] basically took the equivalent, in my opinion, of an oath of office. They were serving on the committee under the terms of the given inflation target.” Posen was generally a ‘dove’, not because he wanted inflation above the target, but because he thought inflation would come down more quickly than others. 8. For this reason, I do not think the MPC would be able to do what the US Fed is currently doing with monetary policy. The Fed has said that they are willing to see inflation go (a little) above their 2% target in order to get unemployment down. I believe the MPC would regard that as violating their remit. It would be useful if the Committee could see if the new Governor takes a different view. 9. If I am right, some change (or official reinterpretation) in the UK monetary regime has to take place. There appear to be three types of change that could be explored: moving to a dual mandate, looking at other measures of inflation, or getting rid of the inflation target completely. 10. Perhaps the most straightforward change would be to make monetary policy in the UK more like policy in the US, by adding an output gap or unemployment objective alongside the inflation target. It would not be necessary, and given current uncertainties it would not be desirable, to specify a particular number for unemployment or output. Instead the MPC could be charged with ensuring output was at a level consistent with long run inflation stability, or some similar phrase. The risk that this change would lead us back to the 1970s is zero. What this change would enable the MPC to do is allow inflation to be above target in 2 years time if they expected the output gap to persist. 11. Another possibility would be to stay with an inflation target, but to broaden the range of inflation measures that were looked at. There is no reason from economic theory why consumer price inflation is the ‘right’ inflation measure to target, and other measures (like output prices, or wage inflation) may be at least as relevant. Unfortunately the series of positive inflation shocks the UK has recently experienced have their maximum impact on consumer prices. Monetary policy in the UK would now be very different if the inflation target was for earnings growth - and there is no reason in terms of the macroeconomics why it should not be. 12. Both these suggestions have one apparent disadvantage: we lose the simplicity and clarity of a single target. By specifying more than one target, and not specifying the trade-off the MPC should use when the targets conflict, we are leaving more to the discretion of the MPC. However, such a regime would still give less discretion to the MPC than monetary policymakers in the US or Eurozone currently have. The targets would still be set by the Chancellor. 13. The third alternative is to replace a single inflation target by a single target for something else. Targets for nominal GDP have been widely canvassed. It is absolutely vital that here a clear distinction is made between targets for nominal GDP growth, and targets for the level or path of nominal GDP. It is the latter that many economists have recently suggested might offer some clear advantages over inflation targets, and which were discussed in a recent speech by the new Governor. 14. As some eminent macroeconomists, like Michael Woodford, have been arguing for the advantages of such ‘history dependent’ targets for some time (well before the recession), a debate on their merits is overdue. Although this issue is widely discussed in the US, we have very little discussion in the UK. This may be because the natural host for such a discussion would be the Bank, but the Bank has felt that it would be inappropriate for it to question its own remit. I hope the new Governor does not take that view, and it would be useful for the Committee to ask him about this. If the Bank, under its new Governor, still felt it inappropriate for it to lead a discussion on the merits or otherwise of NGDP targets, then the Committee itself should think about undertaking this role. 15. While I would welcome an extensive discussion of this type, it would be unfortunate if that debate put on hold any change in UK monetary policy. As I have argued above, policy is providing insufficient stimulus to the UK economy now, because of the form of the current monetary policy regime. Changes could and should be made to that regime now, without in any way prejudicing the results of a more extensive debate on NGDP targets. That is why I think it is important to address the possibility of moving to a dual mandate, or looking at alternative inflation measures. Macroeconomists use almost as many names for this sustainable level as there are estimates for its magnitude (natural rate, NAIRU, natural level, output potential...), but unless anyone wants to suggest that none of those currently unemployed are capable of working, there can be no doubt that UK output is currently below this level. Labour productivity in the recession: why are the UK and US so different? I’m afraid this post is going to seem like an episode of House, except without finding out what the patient had at the end. Indeed it is not even clear which patient, the UK or the US, has the unusual symptoms. Here are two charts, taken from a new study by the Institute for Fiscal Studies. 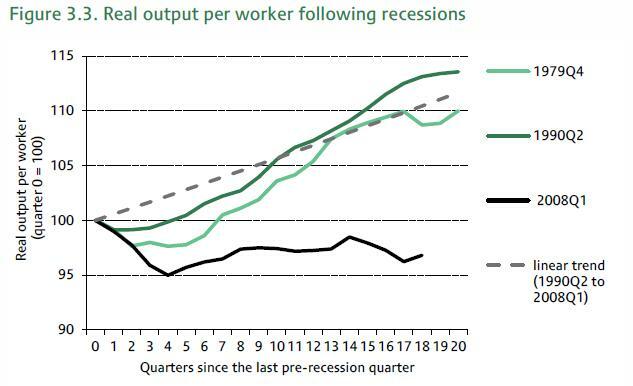 The first compares UK labour productivity in this recession and two earlier large UK recessions. The second chart compares labour productivity growth in this recession across selected countries. These are startling differences, so what can explain them? The IFS study, which builds on earlier analysis by the Bank, MPC member Ben Broadbent, and others , has some ideas about some things that may be going on and some things that are not, but I think its fair to say that we are still in the conjecture phase on this. So this post is mostly conjecture. Let us start with the first chart. There are two classes of explanation for such a dramatic change. One is that the structure of the UK economy has radically changed. The other type of explanation is that the nature of the recession is different, and so the outcomes are also different. This recession has been generated by a financial crisis rather than by tight monetary policy. However, the fall in productivity growth in the UK is pretty widely spread across industries, so it is not a composition effect caused by a decline in the financial services sector. We need more clues. One clue may be the unusual behaviour of UK real wages, which have fallen in this recession to a much greater extent than they did in earlier downturns. Unfortunately there is a chicken and egg problem here: does real wage growth reflect productivity growth (as it generally does in the long run), or does it have a causal role? It helps here to look at investment. Investment always falls in a recession, but UK investment has fallen by more in this compared to earlier recessions. This leads to one possible story: factor substitution. Firms are replacing machines by workers, because real wages are low. Real wages are low because the UK labour market has become more flexible, and workers are cutting wages in response to unemployment by more than they used to. So this is a structural change story. If true, this could be good news. If the economy recovers and unemployment falls soon enough to avoid significant hysteresis effects, real wages will increase again, factor substitution will go into reverse, and labour productivity will make up lost ground. I’m sure there is some of this going on. But it does not account for why the same thing has not been happening in the US, the archetypal flexible labour market. In addition, Ben Broadbent argues that a much larger fall in investment would be required to explain observed productivity this way. There are also many other reasons why investment in this recession might be relatively low. The size of the downturn is greater, as is probably its expected duration (or at least the uncertainty associated with it’s duration). In addition, firms may just not be able to invest because banks will not lend them the money. Here is another interesting clue. Large firms appear not to suffer from this problem: they have plenty of cash. There is some evidence that small firms, who are both more reliant in the UK on bank finance and are a more risky proposition, may have been subject to credit constraints. However we should not forget a third category of firms: start-ups. This story puts the unusual nature of the recession - a financial crisis and an associated reduction in risk taking - at the centre of the explanation of the UK productivity puzzle. There is also a nice corollary, which I have not seen emphasised elsewhere. To the extent that new entry has become less likely because of a lack of finance, the extent of competition has decreased. (Markets have become less ‘contestable’.) This will allow existing firms to increase profit margins, which may also help explain why UK inflation has been surprisingly persistent in this recession. So the story helps explain two UK puzzles rather than just one. Yet this is a story that explains one of the charts - unusual behaviour in UK productivity - but not why none of this is visible in the US. Indeed, given that many European countries have similar profiles to the UK (except just not so bad), and given the econometric evidence noted below, the puzzle here may actually be the US. There are many people who know much more than me on these issues, but at the moment I cannot see any obvious reason why the US should be different. The US banking industry appears much less concentrated than in the UK: there are many more US banks than UK banks even after allowing for the different size of each economy. I have seen it suggested that larger banks may find it more difficult to use local knowledge about particular markets or industries, local knowledge which could help offset the impact of higher risk aversion on innovation. Perhaps US start-ups have access to a greater range of sources of finance than those in the UK, but there seems to be the same concern in the US about small business lending as there is in the UK. So I do not think we even have a potential answer to the puzzle posed by both charts, although I should also note an ever present danger in macro of trying to explain too much with too little data (to overfit). A recent very good study that tries to maximise the data by looking at financial crises the world over has just been published by Nicholas Oulton and María Sebastiá-Barriel. They find that financial crises not only tend to lower productivity by more than other types of recession in the short run, but also that there is a permanent productivity effect from financial crises. However they also find that this long run effect is not robust - it comes from the inclusion of developing countries in the data set, particularly Latin American countries. Which suggests that nothing is inevitable, and being fatalistic about potential output that we can never get back may be a big mistake. Bruegel has some useful links here. This includes some who still believe a lot of labour hoarding is going on, and I would not want to discount that possibility. For example Caballero, R. J., Hoshi T and Kashyap A. (2007) “Zombie Lending and Depressed Restructuring in Japan”, American Economic Review 98. In fact an increase in monopoly power in the UK following the recession would produce on its own higher inflation, lower real wages and lower labour productivity (via factor substitution). However it would also imply a falling labour share, which as Chris Dillow points out does not appear to have happened. So you need to add some additional productivity story as well. Miles Kimball was ahead of me in thinking about the safe asset problem. It was interesting that we seem to have reached similar conclusions thinking about very different things. He focused here on the immediate problem of what the Fed was buying as part of QE, whereas I was in a fictional (and perhaps utopian) world centuries ahead when the government owned net assets rather than net debt. A sovereign wealth fund can be helpful in both cases: the monetary authority can ask the fund to make the decisions about what assets to buy, and the fund can provide the assets to either match against government debt or help reduce the need to raise taxes to pay for government spending. A short list of his posts on this issue can be found here. They are especially relevant for the UK if you are worried that all the Bank has been doing with QE is buying Gilts. The discovery of a finite natural resource is an ideal experiment in teaching macro. It uses the intertemporal consumption model to illustrate why current account deficits (pre-extraction phase) and surpluses (extraction phase) can be optimal things for economies to have. I’m afraid I use the discovery of North Sea oil as my example, and luckily there is still enough there that no student will ever say to me ‘so there was once oil under the North Sea?’  But my excuse for showing my age is that it also allows a very nice contrast between what happened in Norway and what happened in the UK, and a nice way to throw Ricardian Equivalence into the teaching mix. For anyone who does not know, Norway invested (and continues to invest) most of its tax receipts from North Sea Oil into a Sovereign Wealth Fund (which used to be called the Petroleum Fund, but is now rather misleadingly called the Government Pension Fund.) It was not a token exercise - its assets are around $654 billion, which is larger than Norway’s GDP. The UK, mostly under the Thatcher government, decided instead that it was better to give this money to the people, so it cut taxes using its receipts from North Sea Oil. Under Ricardian Equivalence, where agents who care about their children as themselves also internalise the government’s accounts (which include any oil fund), what the UK and Norway did will have identical effects. They will have identical effects, because those receiving the tax cuts will invest much of the proceeds so that when the oil runs out, they (or their children) will be able to carry on as if nothing had happened because they can consume the returns from those assets instead of revenues from the oil. It is a classic example of consumption smoothing: saving or borrowing to smooth out the impact of variations in income. We know people do sometimes try and consumption smooth, because most save for their retirement. Yet did UK consumers save the proceeds from oil to create their own personal equivalents of Norway’s oil fund? The data is not very promising. While the UK ran some current account surpluses in the early 1980s, there were also deficits, and by the late 1980s there were only (large) deficits. We almost got back to current account balance in the late 1990s, but have had large deficits ever since. No obvious sign of saving the revenues from oil there. Looking at our net foreign asset position is initially a little more hopeful, as it’s positive value increased in the first half of the 1980s, but that disappeared for good by 1990, and the UK is now a net debtor. Perhaps a more detailed study might come to different conclusions, but I do not know of any that does. Nor did the government set a very good example. It should at least have been running down its net debt position while North Sea oil revenues were at their peak, so that it could reduce the need to raise distortionary taxes once the money ran out. Net government debt did fall in the second half of the 1980s, but it went straight back up again in the early 1990s, suggesting this was just a cyclical effect. What has this got to do with safe assets? Only this. One of the arguments against establishing a Sovereign Wealth Fund is that, even if the fund is nominally independent, governments cannot be trusted not to interfere, and so it is better to give the money to the people. Miles Kimball discusses this ‘libertarian’ view here, and I alluded to the ‘communism by the back door’ idea at the end of my earlier post. That, presumably, was part of the justification for not establishing an oil fund in the UK in the 1980s. I suspect if you asked most people who were born in the UK in the decade after North Sea oil started flowing whether the UK or Norway made the better decision, they would say Norway. In Norway, I suspect they would say Norway too. The evidence seems to suggest they would be right. So in this case at least, not setting up a Sovereign Wealth Fund for ideological reasons was a mistake. How to use resource revenue is a critical issue for many developing countries, and is discussed in many places by my colleagues at the end of my corridor, including here. Of course many would not have a view, but I cannot help feeling that strengthens the case for a Fund. Interestingly it seems that it is the right in Norway that want to spend more of the Fund today, and the left that (financial crisis aside) want to stick to their 4% rule.